WINDSOR PARK BAPTIST CHURCH ... No vacancies at this time. EQUIP is a ministry of Windsor Park Baptist Church and a leading mental health organisation that provides an innovative model of care, effective support and education in the greater Auckland region. Click here to see Equip's website and here to see staff vacancies within Equip. For vacancies in cafewindsor, click here. For vacancies in Small Fries Christian Childcare Centre, click here. 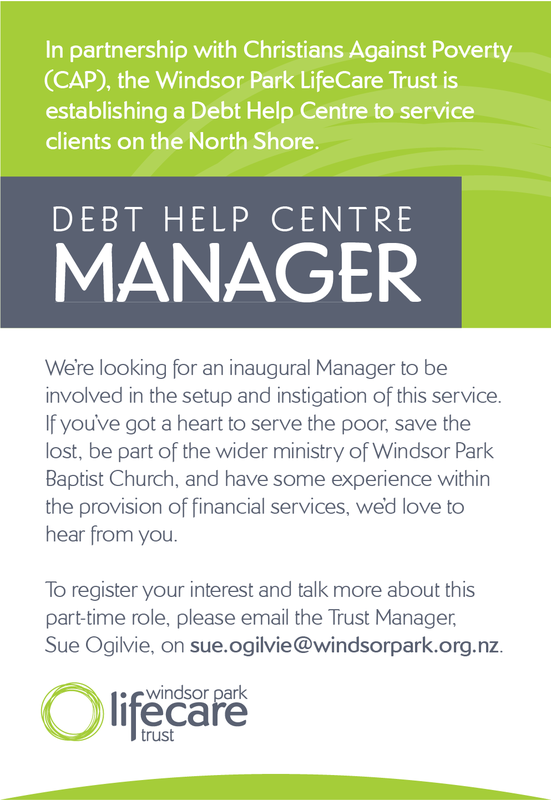 The WINDSOR PARK LIFECARE TRUST is a ministry of Windsor Park Baptist Church and is currently looking for a Manager for the inaugural ministry, the Debt Help Centre Manager. Click here for more details.